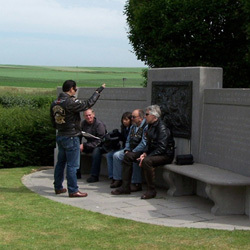 6 intrepid riders with 5 bikes left these shores to commemorate the 90’th anniversary of the start of the Battle of the Somme - Michael Howers, Dietmar Kohls, Richard Stephens, Aeron Allen and Rebecca Mordecai (riding pillion) and myself. Like all meticulous plans, events rarely unfold as intended. In our case, standing orders were to “...meet up on the left before the check-in barriers at Eurotunnel at around 07:45” on the Friday morning for the 08:28 train. However, when I arrived at Eurotunnel, only Aeron and Rebecca were to be seen. No matter, Michael, Dietmar and Richard must still be on their way (thought he to himself in a bout of mindless optimism). Yet, come 08:00 still no show and we were pushed to make the 08:28. At last Michael answered his mobile - these other 3 had long gone through the barriers and were waiting on the other side. Hey guys, which bit of “let’s meet up before the check-in barriers” did you not understand? Now, Aeron, Rebecca and I were in a race against time to get through the barriers (those automatic check-in machines ain’t the most user friendly), clear security and make the line for the train. Once French side it all got better from there. The weather was perfect and the riding was good. We made the hotel in Arras comfortably, had a spot of lunch and then rode into Albert to check out the battle museum and orientate ourselves for the main touring the next day. Saturday was a scorcher, just like the opening day of the Battle in July 1916. With our thirsts slaked by the (very) occasional ‘Leffe’, we accomplished a lot on the day and took in many of the principal sites. Although we were just a week away from the main 90’th anniversary weekend celebrations, the area was not too crowded with and we got around unhindered by the road closures that would mark the next weekend. By late afternoon, we were ready for a strategic retreat back to Arras, to line our stomachs in the hotel bar before supper and then to check out the grub in one of Arras’ picturesque squares. Now, it simply wouldn’t be a H.O.G. ride if we didn’t get inclement weather at some point, would it? Sunday started wet and got worse. The plan had been to take in more of the battlefield but, with changed conditions, we decided unanimously to retreat direct to Calais, taking in one stop en route. One of Michael’s forebears was buried in a war grave near Arras, so we decided to pay our respects. Only problem - it was off the beaten track and it was raining hard. After negotiating our way through beet fields and the like (at points, nearly literally! 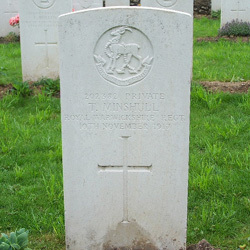 ), we successfully found Private Minshull’s resting place. Now, the motorway beckoned and Calais called. Of course we arrive much earlier than originally planned and managed to get on a train 3 hours early. I got home just in time to witness England battle to their ‘comprehensive’ 1:0 victory over Ecuador in the World Cup. And so, another intrepid C&F Ride was in the logbook. My thanks to Michael Howers for his support and to my other fellow riders who helped to make it a very enjoyable trip.